Jack White recently wrapped up an acoustic tour with the intention of taking a break afterwards — which to Jack White apparently means expanding his vinyl empire and announcing a new album with the Dead Weather. Titled Dodge & Burn, the album is set to arrive on September 25 though Third Man Records. True to his word, though, White and the band won't be hitting the road in support of the new record. Several singles from the album were previously released as 7-inches through Third Man's Vault subscription service, including "Open Up (That's Enough)," "Rough Detective," "Buzzkill(er)" and "It's Just Too Bad." Those four tracks can now be streamed digitally as the Dodge & Burn sampler in the player below. 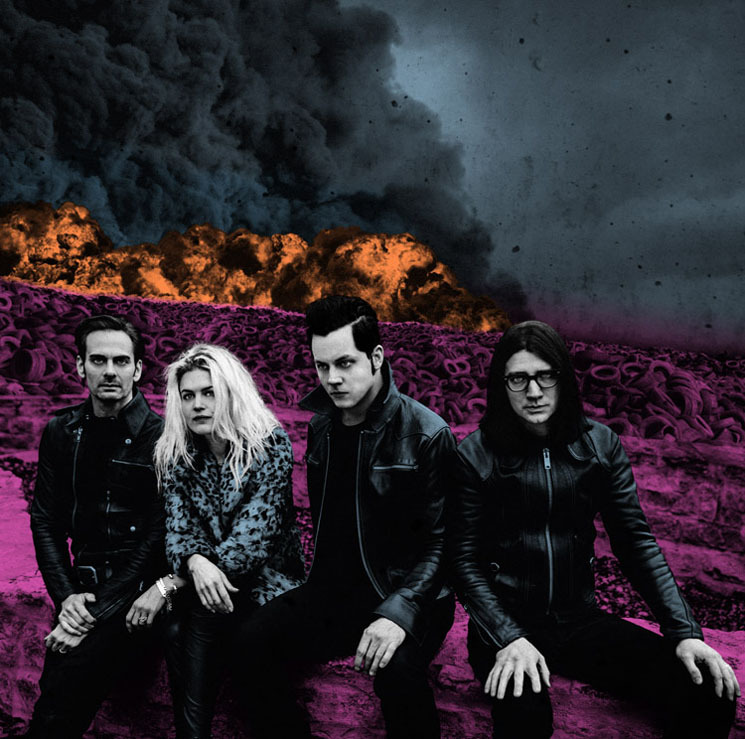 They'll be joined by eight newly recorded, previously unheard tracks to fill out the new LP, which was recorded in Nashville and features the original lineup of White, Alison Mosshart (the Kills), Dean Fertita (Queens of the Stone Age) and Jack Lawrence (the Raconteurs). It wouldn't be a release from White without some quirky perks, so naturally, Third Man Records is offering Dodge & Burn as part of a deluxe package that includes the LP on opaque yellow and black "Inclement Weather" vinyl with an embossed sleeve and alternate album art, the new single on 7-inch (also on yellow and black wax), and a deck of custom Dead Weather playing cards featuring the band members as the King, Queen, Jack and Joker. The deluxe Vault package can now be ordered through July 31.